Loose Strife. Quan Barry. University of Pittsburgh Press. Pittsburgh, Pa. 2015. Quan Barry is utterly magic. Not that smarmy bright light "and for my next trick..." magic. Barry is magical because she instantly transports the reader to a new reality. We recognize where we are at all times when reading Barry but also realize it has never looked quite so real in quite this way. Whether she is writing about the killing fields of Cambodia or the tunnels of Cu Chi, and we have all heard the horrors, the reader is whisked to a reality previously invisible and unavailable. Barry pulls off the remarkable feat of being clear like crystal but hard as diamond, hard as nails, and at the same time so gently and lovingly human, it is almost impossible to reconcile the two. Barry does it. Loose Strife is in this case - the endless battle we all endure in trying to become humane. Quan Barry is quite simply masterful. the critic writes, "Barry seeks not to judge but to understand." represented in the photo but because of her calmness. like a calcified eye, the woman's face aglow with a knowingness." to do the grisly work that precedes paradise. in only a handful of places in the history of the visible world. Tuol Sleng prison, hill of the strychnine tree. of poetry in this country and each one is still meant to be sung. PLEASE NOTE, TBOP was unable to reproduce Quan Barry's poems exactly as they appear in her book. We apologize profusely to both Ms. Barry and to the University of Pittsburgh Press. We here at TBOP will continue to try to improve our technical proficiencies. A thousand monkeys, a thousand typewriters. Perhaps a word about style. Today's book of poetry has no clue why Barry has chosen a variety of formal constructs for her poems. These deliberate forms are consistent blocks, columns of text with perfect margins down both sides. I'm sure it means something and I assure you there isn't a comma out of place in these panoramic puzzles. But I don't know what it means and don't really care. Why would I? 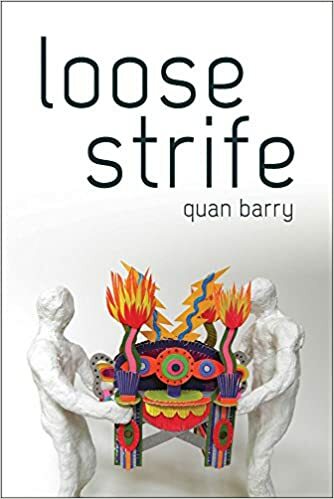 Loose Strife is a solid as it gets, Quan Barry is a stone cold heavyweight. Period. How is it possible that one person knows what Quan Barry knows? Who can know this? How is it possible that Quan Barry riffs across the water as though she were the Siren of Time. Do you get the idea that TBOP likes this absolutely stunning book? Loose Strife compels you to turn the page. & the world went black. down a bedding of apricots. what he was really saying. I cried. I am of his flock. Sister, how it grieves me. love of poetry. Yeah yeah. many ways to touch someone. the duality of the word cleave. Barry does not hesitate to dance into the darkness where others fear to tread. With chops like these she can do whatever she likes and thank you, thank you, thank you. Reading Quan Barry for the first time makes me think of my younger self, makes me remember the first time I read Michael Ondaatje, Charles Bukowski, Kurt Vonnegut. I remember those books, where I was at the time, and I know I am going to remember reading Barry forever. These poems have heart and are heartlessly blunt. These blunt poems have beauty in spite of the bloody wounds they sever open. and killed, pierced with metal, their bodies completely shaved. So many ways to be invisible, so many ways to be erased. saying any little thing will help. Everyone dreams of being harmed. The other time I went invisible I went invisible for six whole weeks. in a UPS uniform and a truck could still go anywhere he pleased. stringing her up by a series of hooks before finally garroting her with bailing wire. In the photo, I imagine she is on her way toward a body of water. of children. EUTEKVIA. Lord, have mercy on us. She is fourteen years old. These poems have power, magic and grace. Hard to beat those three. Quan Barry is spectacular, seriously. These poems move us all one step closer to a better understanding of what it is to be human beans. Reading these poems makes you feel smarter.